God exalted Daniel and his three friends Shadrach, Meshach, and Abed-Nego, revealing the dream of the king and also showing them the interpretation of the dream and because of that Daniel could tell what the dream of the king was and what the interpretation of the dream is to the king. But it was not the end of their problem. Further reading tells us that challenges and big troubles came in their lives and how they came out of all those troubles victoriously. The reason was simple that they trusted in Lord God almighty instead of trusting in their own power and gave their matters in the mighty hand of God, when they did so God Himself took care of those things. We read about the most challenging times for Shadrach, Meshach, and Abed-Nego in Daniel 3rd chapter that the king whose name was Nebuchadnezzar made an image of himself in gold, whose height was sixty cubits and width six cubits. He set it up in the plain of Dura, in the province of Babylon. Then the king sent word to gather together all the high ranking officials of the provinces, to come to the dedication of the image which the king had set up. So all the officials gathered together for the dedication of the image that the king had set up; and they stood before the image. Then a herald cried aloud: "To you it is commanded, O peoples, nations, and languages, "that at the time you hear the sound of the horn, flute, harp, lyre, and psaltery, in symphony with all kinds of music, you shall fall down and worship the gold image that King Nebuchadnezzar has set up; and whoever does not fall down and worship shall be cast immediately into the midst of a burning fiery furnace." So at that time, when all the people heard the sound of the horn, flute, harp, and lyre, in symphony with all kinds of music, all the people, nations, and languages fell down and worshiped the gold image which the king had set up. But Daniel's three friends did not do according to the king's order. Therefore at that time certain Chaldeans came forward and accused the Jews. They spoke and said to king Nebuchadnezzar, "O king, live forever! You, O king, have made a decree that everyone who hears the sound of the horn, flute, harp, lyre, and psaltery, in symphony with all kinds of music, shall fall down and worship the gold image; and whoever does not fall down and worship shall be cast into the midst of a burning fiery furnace. There are certain Jews whom you have set over the affairs of the province of Babylon: Shadrach, Meshach, and Abed-Nego; these men, O king, have not paid due regard to you. They do not serve your gods or worship the gold image which you have set up." Then Nebuchadnezzar, in rage and fury, gave the command to bring Shadrach, Meshach, and Abed-Nego. So they brought these men before the king. Nebuchadnezzar spoke, saying to them, "Is it true, Shadrach, Meshach, and Abed-Nego, that you do not serve my gods or worship the gold image which I have set up? Now if you are ready at the time you hear the sound of the horn, flute, harp, lyre, and psaltery, in symphony with all kinds of music, and you fall down and worship the image which I have made, good! But if you do not worship, you shall be cast immediately into the midst of a burning fiery furnace. And who is the god who will deliver you from my hands?" But to the surprise of the king and everyone listening Shadrach, Meshach, and Abed-Nego plainly said to the king that they are not going to worship anything that is not God. Finally they ended up in the burning fiery furnace. But God who does not leave His children alone, came down in the midst of the burning fiery furnace and He walked with them. When Shadrach, Meshach, and Abed-Nego were in desperate need of God, He came for them. My friend, you may be going through tough times but God will not forget you, if you are His child, He will come for your rescue. He will not allow you to die in the burning fiery furnace. The same God came down in this world to rescue us from eternal death and destruction which we had to face because of our sins. But He gave His only son to die for us so that we could live forever. Today, we do not need to die (spiritually) and we do not need to go to hell because God has done everything for our rescue. We have just to come at the feet of Jesus and receive the gift of eternal life which He is offering. 1 King 18:7 Now as Obadiah was on his way, suddenly Elijah met him; and he recognized him, and fell on his face, and said, "Is that you, my lord Elijah?" 1 King 18:8 And he answered him, "It is I. Go, tell your master, 'Elijah is here.'" 1 King 18:9 So he said, "How have I sinned, that you are delivering your servant into the hand of Ahab, to kill me? 1 King 18:10 "As the LORD your God lives, there is no nation or kingdom where my master has not sent someone to hunt for you; and when they said, 'He is not here,' he took an oath from the kingdom or nation that they could not find you. You all know the story of Elijah that king Ahab was after him, to hunt him down, to capture and kill him, but the king could not catch him. How in the world it could be possible that a king could not catch an ordinary man. You know that kings had power in those days that whatever they wanted they could do and no one could stop them from doing it. He had power, he had the whole army in his hands and nothing was impossible for the king. But in the Bible we read the story of Elijah "the prophet of the God of the Bible" whom the king could not catch at any cost. 1 king 18:10, says that no nation or kingdom was left where the king had not searched for Elijah but surprisingly he could not find him The simple reason is Lord said him to hide in the river Cherith. Not only that, God had ordered crows to feed him. What an awesome God we have on whom we can trust for our safety and protection. Every time I read this story it thrills me and reminds me the awesomeness of the God of the Bible. 1 King 17:3 "Get away from here and turn eastward, and hide by the Brook Cherith, which flows into the Jordan. 1 King 17:4 "And it will be that you shall drink from the brook, and I have commanded the ravens to feed you there." And also you can watch that video here. We had several of such experiences in the past few years. I would like to share with you two of them. Once God showed a dream to me and alerted regarding the presence of a 'hit man" around our home. I had written of that story long back which you can read here the title was "Dreams - Current News Bulletin from Heaven"
Once we had to go to church and we were getting ready. One hour before that we saw two men sitting in the balcony of the hitman and talking. Meanwhile they would look at our door now and then. I asked my brother, "Are you sure, are we going, did you really hear from Jesus?" He said, "Yes". We got ready and stepped out of our door and they never looked toward us. I wondered because if one or two people were going out it might go unnoticed but when five people are stepping out it is hard to think and when you are especially on some kind of assignment or sitting with some purpose. On top of it when we close our door it makes a big noise. Well they never looked toward us. We do not know why, but it could be possible that Angles of God stood and blocked their view, or they were distracted by something and they could not notice. Well but the very next day the story was different. My brother and I stepped out from our front door to just grab the news paper. We saw that one of the men of previous day was sitting there. As soon as we stepped out he stood up in a hurry. He looked toward us and looked kind of restless. We do not know what was he thinking or why he jumped up seeing us going out. But in another few times we could see hitman following us. The second incidence which took place was a few months prior to this one. One day we wanted to mow our lawn. We prayed and decided to do the work. As we were getting ready to step out I saw the hitman leaving. So I said to my brother, "he is leaving and it looks to be perfect time to do the work." As we stepped out his wife saw us and she rushed out in a hurry. I told my brother, "probably she went out to bring him back and he might be back soon." We were mowing our lawn and hardly fifteen minutes have passed by and I saw two vans coming. I figured out that both of them were back. I asked my brother, "he is back, are we staying or leaving?" My brother said, "we are finishing the work." He got out of his van as they lived two houses away from us. He looked toward our lawn and walked away. It looked like he gave a "blank stare". When you see nothing or no one, you just give a blank stare and then you don't look again. The same thing we felt. I told my brother and sister, "it looks he saw nothing, and we seemed to be "invisible" to him? My sister also said, "it looks he saw the empty lawn." But how could it be. It was amazing and kind of surprising. He walked away to his house. We worked there for the next twenty more minutes and finished the work. I can say that it could be possible that God sent His Angels and they blocked their view like the story of Randy DeMain. When we pray and go ahead knowing the will of God we know that we are under the safe protection of Jesus. We saw no Angels but it could be possible as Bible says, God has kept Angels for the protection of believers and they are ministering spirits. 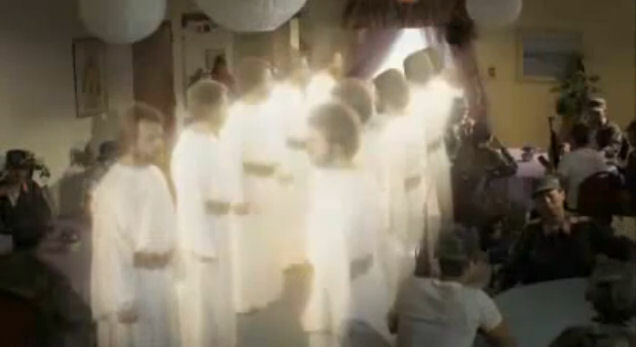 Hebrew 1:14 "Are they not all ministering spirits sent forth to minister for those who will inherit salvation?"